Respect and trust among European delegates in spite of differences. It is no secret that there are different understandings of human sexuality, and of what the best way forward is, among the 40 delegates from Europe and Eurasia. 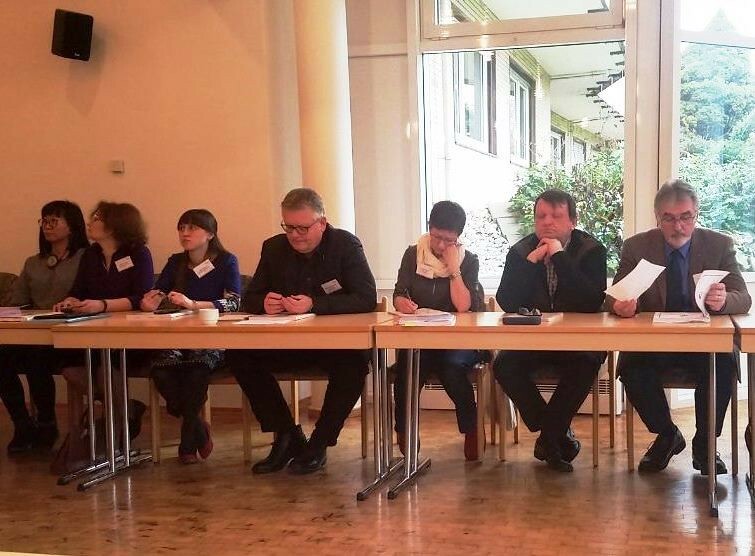 This was quite clear when the delegates met in January in Braunfels, Germany for three days of worship, prayer, conversation, reflection and fellowship. The purpose of the gathering was to give the European and Eurasian delegates the opportunity to meet and to reflect and pray together in preparation for the upcoming called session of UMC General Conference. Bishops Streiff, Rückert, Khegay and Alsted led worship and facilitated the plenary conversations. In small groups composed of delegates only from all episcopal areas, the participants discussed the report from the Commission on a Way Forward, the petitions for the three plans as well all other petitions. In the conversations, the participants emphasized, what they saw as challenging and problematic in the different petitions, and they discussed possible changes to improve the plans. Most attention was given to the One Church Plan and to the Traditional Plan. They also briefly looked at the additional petitions beyond the report from the commission on a way forward. Furthermore the delegates debated how different plans might affect their annual conferences and possibly the three European Central Conferences. With a unanimous vote of the delegates present, they decided to propose an amendment to the One Church Plan that will prevent a legal vacuum in central conferences between the 2019 called session of General Conference and the regular sessions of central conferences. The delegates reflected deeply on how to best support each other in maintaining a prayerful attitude of convicted humility throughout the General Conference, especially when tension increases. Many expressed concern over the political maneuvering and lobbying that takes place before and during General Conference and found such behavior difficult to reconcile with their understanding of how the church should conduct its decision making processes. Culture, State legislation, morality and ministry in the 27 countries in Europe and Eurasia with a United Methodist presence from Kazakhstan to Algeria and from Germany and to Latvia is very diverse, and yet strong ties of love, trust, fellowship and Methodist identity exist that binds the church together. The gathering of delegates showed, that Methodists in Europe and Eurasia hold strong convictions, but they are still capable of having respectful conversation and listen deeply, as they seek to understand, respect one another and avoid creating winners and losers. The delegates expressed concern about the future of the denomination, but at the same time the atmosphere was hopeful, and several lifted up the desire to remain united and in the very diverse contexts in Europe and Eurasia to promote the mission of making disciples of Jesus Christ for the transformation of the world.